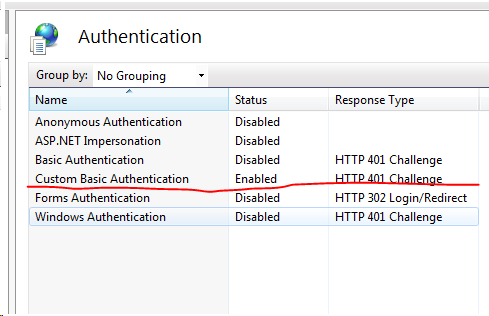 Installing and Using Custom Basic Authentication for IIS7. 1. Download the code from http://custombasicauth.codeplex.com/. 2. Open visual studio command prompt by right clicking run as administrator. 3. Cd to the folder where you unzipped the downloaded source. 4. In the output folder there is Install command file. Edit this file in notepad. 5. Remove “rem” from line 16 rem iisschema.exe /install CustomBasicAuthentication_schema.xml. 2. When the command “iisschema.exe /install CustomBasicAuthentication_schema.xml” is executed 2 things happen. 3. When IisRegMgmt is run it edit administration.config file. 1. Create an empty asp.net website. 10. In the web project add reference to this class library. This entry was posted in .Net 4.0, ASP.Net, IIS7 and tagged Authentication, Custom Authentication, IIS7. Bookmark the permalink. First of all, thanks a lot for this article, it helps me a lot ! But I’ve got a problem : I can’t get the customBasicAuthentication working… I need it for a REST WebService, which has to be secured by customBasicAuthentication over HTTPS on my IIS7 server, and later on Azure. Can you see anything that I did wrong, could you help me please ?